Will a new presidential decree impose the ideological control on performers in Belarus? The Belarusian Orthodox Church gives a loud "no" to capital punishment. Who can improve the problematic relations with Ukraine? Over the last two weeks Belarusian press covered a wide range of topics. The head of the Belarusian Orthodox Church says "no" to capital punishment. Business-oriented Belarusy i Rynok weekly reports that the head of the Belarusian Orthodox Christians Filaret spoke out against the death penalty during a round table that recently took place. Apart from the Orthodox Church, the representatives of the Roman Catholic Church, legislative and judiciary authorities, delegates from the Council of Europe, diplomats and human right activists participated in the event. As the newspaper reports his words "We, Christians, cannot legitimise capital punishment since this is the sin of murder (…) We, sinful people, are not to grant life to a person, neither we should decide about a person's existence." The newspaper notes also that before the Orthodox Church remained "heard less" than the Catholic Church when it came to public discussions of death penalty in Belarus. In 2011, aftermath the death sentence of Vladislav Kovalev and Dmitrii Konovalov, the head of Belarusian Roman Catholics, Tadeusz Kondrusievich, appealed for a moratorium for the convicted for the explosion in the Minsk metro. The newspaper noted that the top cleric of the Russian Orthodox Church (to which Belarusian Orthodox Church belongs), patriarch Kirill spoke out against capital punishment, other than in certain situations, for example against terrorists. Ideological control of performers? Daily Narodnaja Volia comments upon the newest decree of Alexander Lukashenka on cultural events. According to the new law, organisers of any cultural event will need to apply for a special permission from the Department of Ideology, Culture and Youth Affairs in advance. Foreign performers will have to make a payment to a special presidential fund supporting talented youth. Belarus-Vatican relations. The state-run daily Sovetskaya Belarusiya reports on a meeting between Alexander Lukashenka with the Apostolic Nuncio, Claudio Geggerotti. As the newspaper notes, both countries are conducting a "constructive dialogue" and their relations remain warm. In Lukashenka's words, "I am thankful for the Catholic Church and Vatican for its support … on the international arena. Primarily, in the establishment of a dialogue with the European Union". The newspaper reports that he made an open invitation for a Papal visit to Belarus. Makei can travel to the European Union. Komsomolskaya Pravda comments upon recent lifting of visa restrictions from Belarus Minister of Foreign Affairs, Uladzimir Makei. The Belarusian official had remained on the EU "black list" since the 2010 presidential elections when he headed Lukashenka’s administration. According to the newspaper, the visa restrictions against a representative of the foreign ministry was "diplomatic nonsense". In its words "firstly, a Ministry of Foreign Affairs was lead by a diplomat who could not obtain a Schengen visa, and as a consequence, he could not meet with his colleagues". Now Makei will be able to participate in the direct meetings of the Council of the EU which will simplify diplomatic relations between EU and Belarus. According to an ​expert quoted by Komsomolskaya Pravda, the recent decision of Brussels means that the EU has started to talk in public to the Belarusian authorities. Lifting the travel restrictions on the minister of foreign affairs will allow him to participate not only in the autumn summit of Eastern Partnership in Vilnius, but also in other meetings. Forbidden flag as national heritage. Daily Nasha Niva informs that BMAgroup, Art Siadziba and Rock-Salidarnasc started collecting signatures for a petition to the Ministry of Culture. The activists want the white-red-white flag to be on the list of symbols of historical-cultural heritage. The newspaper stated that the action takes place within another action that aims at the popularisation of the national symbols of Belarus, white-red-white flag and emblem of "Pahonia". The results of the campaign will be known 27 July. Bitter-sweet Belarus-Ukraine wars. Belorusskaya Delovaya Gazeta writes about an ongoing crisis in the relations between two countries. It started in the beginning of April when the Belarusian customs did not allow the Ukrainians to transport confectionery goods through the territory of Belarus. The newspaper writes that Ukrainian exports to Belarus confectionery for $60m per year and remains the fourth largest market for the Ukrainian sweets that is more over 5 per cent of total exports in 2012. 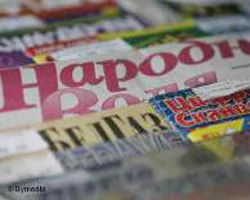 The newspaper goes further to share that politicians have already discussed the confectionery issue at the inter-governmental level. Recent tensions may indicate, however, deeper problems that "should not be postponed to the future". Economic relations between Belarus and Ukraine have been mostly positive for both countries, but the trade wars in the sphere of oil and confectionery broke out and have soiled relations. The World Congress of Russian Press. Nasha Niva reports how Alexander Lukashenka has opened the World Congress of Russian Press. As the newspaper put it, "the foundations of Belarusian statehood and that what is used to be called as the Belarusian model of development, are laid in the particular spiritual values and cultural progress which the Russian civilisation, the Russian world has given". Lukashenka highlighted also the role of Russian language for Belarus, as well as for Ukraine. Minsk, a metropolis of 2 Million, presents itself as a modern high-tech capital, amazing its visitors with flat screens in the metro stations, and modern buildings with glass fronts everywhere. While Minsk expands steadily – the number of inhabitants and the territory it includes grow steadily- the majority of Belarusians are living outside the capital. According to the National Committee of Statistics, in 2011 75.1% of Belarusians live in urban areas, which include the regional centres like Brest, and Mahileu, but also smaller towns (in Belarus, a town describes a settlement with more than 6,000 inhabitants). This leaves one fourth of the population living in the countryside, which differs, in fact, from the urbanised areas: Wide fields, forests and scattered settlements characterise the rural parts of Belarus. Going to a Belarusian village today feels like going back in time. In Belarus, like in most other countries, urbanisation is a common phenomenon. After the World War II, the share of Belarusians living in rural settlements decreased dramatically from 80% to today’s figures as a consequence of the progressive industrialization of the country. However, more than 23,000 rural settlements have been counted in the 2009 census. Today, the average number of population in a village amounts to 103 inhabitants- more than half as much as in 1959. As in most countries, mainly young people leave the countryside to live in the towns. One reason for rural exodus lies in the need earn their living. This is not possible in most of the villages that often lack a modern infrastructure. Some people work in nearby collective farms (former Kolkhozes) and bigger villages have a shop, but apart from this, they earn money by working their own land. Apart from the financial aspect, life in the villages is hard. While most have electricity nowadays, only few villages dispose of running water. Large ovens in the houses that heated with wood still function as heating. While this seems idyllic for Western visitors, it means a physically hard life for villagers – even more so as very often, only old people left in the settlements, mainly widowed women. Men very often die much earlier than their wives, primarily because of alcohol abuse (alcohol is very cheap in Belarus). The population of some villages therefore consists mainly of old women. Most of them remain completely alone during the week, with their children and grandchildren living in the towns and cities. During the summer, the population of the villages rises. First of all, parents send their children to live with their grandparents in the villages during the long holidays- they last almost three months in Belarus. Moreover, many villagers have bought village houses during the last years. A good house with several acres of land could sometimes be purchased for as little as $500. As demand has risen, people now have to pay around $5,000. 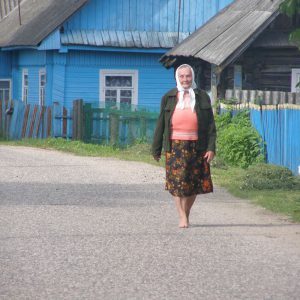 Still, many Minsk inhabitants are glad to escape from city life and spend their free time in a village. This goes back to the fact that for many of them, the village reminds them of their childhood as most of the people living in Minsk do so in the second or third generation. Apart from this, economic instability and inflation make growing fruits and vegetables a necessity for many people. While the villages are revived in this way during the summer, whole weeks may pass in winter where the villagers do not see anybody from the outside. In some of the villages, electricity does not work and the snow clearing vehicles rarely manage to get through to every village. This proves especially problematic in such cases where there is no village shop. In those villages, the population relies on “Autalauka”, a shop on wheels that gets to the villages. The driver of such a shop serves around 100 villages a week. His salary during summer amounts to $500 per months. However, he has to live on what he earns in the summer during the whole year, as he often cannot work during winter because of the snow on the roads. For villagers this means that they do not have an opportunity to buy bread, flour, milk or other products for weeks in a row. Moreover, an ambulance or a doctor can hardly reach frail and elderly during the winter. To fully understand how Belarus functions, one should leave Minsk and take a trip to one of the villages. Only after having spent a weekend there, analysts and policy makers will understand why Belarus still has the current political system and why it proves so difficult for the opposition to reach the people. Life in those small villages seems apolitical, what happens in Minsk does not play a direct role for the villagers – only to the extent that their pensions and food prices rise or fall. Hardly any difference can be spotted in those villages between now and thirty years ago, back in the Soviet Union. Most villagers have seen so much in their lives and they remain so cut off from buzzing Minsk that at any possible demonstrations,one can hardly imagine them supporting opposition politicians or even taking part in a revolution. In an ideal state, the authorities would redistribute the expenses to ensure better medical services in the villages instead of improving the outward appearance of the capital. Moreover, the state urgently needs to create incentives for families to move back to the villages by subsiding private housing and founding schools.